Lower back or lumbar-sacral back pain is very common, affecting between 70-85% of American adults at some point during their lives. In 90% of patients, LBP resolves within 6 weeks with proper back therapy. Mechanical: Pain is located in the lower back, buttocks, and thighs, with possible radiating symptoms to the hips and even feet. The pain is “mechanical” in nature, meaning it varies with physical activity, position, and time. Mechanical back pain may be a result of a facet joint dysfunction or stenosis. Stenosis, in this case, refers to the narrowing of the canal in which a nerve root exits the spine. Musculoskeletal: Most commonly will present as a “muscle pull” or strain. It is most often caused by bending down to lift something heavy or twisting. Discogenic/Degenerative disc disease (DDD): Disc herniation refers to the protrusion or bulging of the gelatinous material (made mostly of water) between the verterbrae of the spine. Spinal degeneration is caused by alterations in the disc (loss of water content) that progress to degeneration. These degenerative changes in the disc and the joints produce symptoms, most commonly morning stiffness, pain with prolonged standing and/or pain with walking short distances, and can often be seen on an X-Ray. Stretching: Patients with LBP often demonstrate poor flexibility in the back, hips and legs. A therapist will provide patients with comprehensive stretches which can be performed at home. Strengthening: Most patients with LBP have weak trunk muscles. 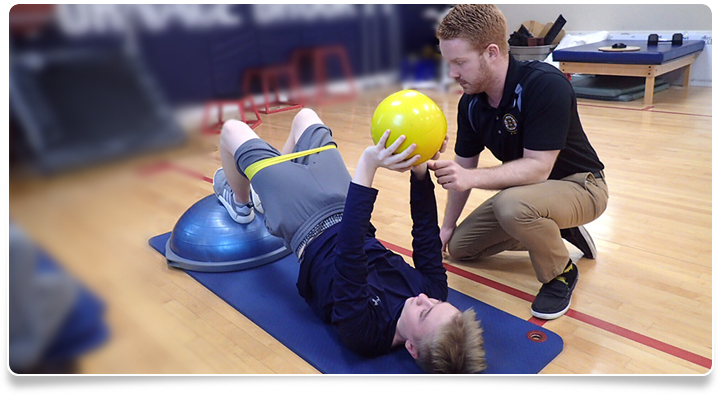 PT can provide patients with exercises to strengthen the “core” muscles (the abdominals and lower back). Posture awareness: Learn proper sitting, standing, walking, and lifting techniques to minimize the stress on the lower back, often referred to as “Back School”. Massage: Often helps reduce muscle tightness and spasms to allow early return of motion. Conditioning: Most studies indicate that people in good physical condition are less likely to have LBP. It also allows them to recover faster in the event of an injury. Modalities: Studies show that modalities should have a limited use in the treatment of LBP. The use of moist heat, ultrasound, and electrical stimulation can help relax the tight muscles in the lower back and accelerate the healing process. Also, the use of a traction machine might possibly help decompress a “pinched nerve” in the lower back.